December 30, 2008 by Alphageek in "alphageek hefeweizen ponderosa lemon wheat beer"
Last Saturday, Mrs. Alphageek and I headed to Washington DC. We had business to attend to in the morning at the train station. We decided to take advantage of some great weather and take in some museums while we were in our nation's capitol. During this trip, it became very apparent to me that many folks have trouble with technology. What alarms the Alphageek is how simple some of the technology is that folks cannot handle. My day started with technology observation and ended with a giant lemon. We decided to travel to the newly renovated Smithsonian American History museum. It has some body's name on it now, but I don't remember the name, but in all likelihood the person is no longer with us. We immediately noticed that some people are now so technology challenged that they cannot operate the door. That's right, Mrs. Alphageek had to show the people in front of us how to open the door. Apparently, reaching out and pulling the door open did not come naturally to them. Next, we decided we were thirsty and that we should purchase something to drink in the nearby snack bar. We walked in to a line that consisted of about fifteen people. It became evident that the technology of the line was too much for them. Fortunately, the Alphageek had a class in queueing theory and knew he could just pass them, take two bottles of water, hand $6 to the cashier, and sit down. I know what you are thinking, what is queueing theory? It is the theory of waiting in lines. Don't worry I took the class so that you don't have to. We looked around the museum for a while, but the museum was pretty busy. It turns out the museum has just recently reopened and the lines were awful. Queueing theory or not, we decided waiting to see Sylvester Stallone's shorts would wait for another time. We headed to the Smithsonian Museum of Natural History. It was pretty nice, but it was getting more and more crowded. We decided to move on. Our next stop was the Spy Museum. This was an interesting museum. First, the lines are extremely long and the museum is very popular. They don't allow cameras, and I can see why. There are so many people in the place that trying to take pictures would certainly be a problem. The museum was a gadget guys dream and a good time was had by all. We went back to the train station to pick up the car. The train station has a great innovation: prepaying for your parking before you get in the car. We went into the parking garage and were presented with many people waiting to use the parking machine. No problem, I tell Mrs. Alphageek, I observed another parking machine on the next floor on our way in. When we arrived on the next floor, there was a shorter line, so we waited, and waited, and waited. The folks in front of me were so slow, the machine timed out. They started over. They finally figured how to pay with a credit card, which is good because there was a big sign on the machine that said "credit purchases only". Their receipt came out. They decided to read their receipt. The Alphageek took classes (in queuing theory?) that were faster when they were. When the Alphageek asked if they were done, could they please move, they were not ammused. Apparently, the technology of the parking machine and receipt was a challenge for them. We paid up in about 30 seconds, and got on the road. Traffic was horrible, so we decided to to stop for dinner at Wegmans. Wegmans is a giant grocery store with a huge amount of prepared food for sale. We decided to use google maps on the Alphageek's blackberry to find the store. Unfortunatly, google maps used user created content to provide the address. In this case, that proved to be bad because the person entered the wrong address. Think about that the next time you look up your medical condition on wikipedia. Not everyone posting to wikipedia is up to Alphageek standards. We then decided it would be good to use the technology in the cell phone and call Wegmans for directions. The call worked well and we were quickly there. We had a great dinner and decided to walk around. We decided to purchase some beer. The beer was an assortment of many kinds, including wheat beer. The Alphageek likes lemon in wheat beer, so we went to the fruits to get a lemon. The store had the biggest lemons I have ever seen. 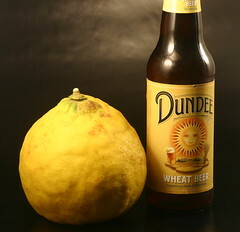 The picture here shows the lemon next to a twelve ounce bottle of beer. I promise the photo has not been doctored. After all, you count on the Alphageek for technology guidance. This is absolutely the biggest lemon I have ever seen. I took it home and tried it. I thought it tasted like a bitter orange. Mrs. Alphageek corrected me and said that it tasted like a sweet lemon. At least Mrs. Alphageek understands technology. After all, she showed the folks how to work the door at the museum. While the lemon might not be very advanced technologically, I am willing to bet the lemon is still too much for the folks at the museum. "alphageek hefeweizen ponderosa lemon wheat beer"